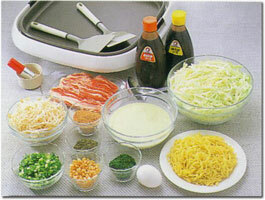 "Okonomiyaki with Stir-Fry Noodles" is the most popular style of Okonomiyaki in JAPAN. A delicious combination of slice cabbage, bean spouts, chopped green onion, egg and stir-fly cooked together on a thin, light crepe base and topped with your choice of seafood or thinly sliced meat. This delicious topping by Otafuku is made from only the finest natural ingredients. Otafuku is "the name" in Okonomi Sauce.We have been specializing in this sauce since 1950. 1: Put the water into a large bowl then add the Mirin and egg. Mix well. Next add the flour and mix until all the flour is dissolved. (Keep the batter in the refrigerator for at least one hour to get a smoother spreading crepe.) 2:Preheat a grill to 160-180℃. Spread the mixture into a thin circular shape on the grill approximately 20cm/7.8inches in diameter. 3: Sprinkle some dried bonito powder and kelp powder on the crepe and then place the sliced cabbage on the crepe. 4:Put the tempura crisps, chopped green onion, bean sprouts and the 3 or 4 strips of pork(=40g) on the top. Then ladle a small amount of batter on the top of these ingredients. 5: Flip it over quickly but gently (pork-side down), using two spatulas. After that use the spatulas to round the edges. Turn up the grill temperature to 200℃ and cook until the vegetables are cooked through. 06: At the same time, loosen the stir-fry noodles with a spatula using a touch of cooking oil and then flavor with 1Tbsp OTAFUKU OKONOMI SAUCE. Spread the noodles into a circular shape as in step5. 7: Place the crepe and filling (you made in step 5) on top of the stir-fry noodles, and round the edges, then press lightly with the spatulas. 08: Drop an egg on the grill, next to the crepe break the yolk and spread it around into a circular shape. 09: Put the crepe and filling and noodles (made in step 7) on the top of the spread egg and flip it over again (the top side should be egg). Generously spread OTAFUKU OKONOMI SAUCE on top 10: Sprinkle Aonori (seaweed). Enjoy eating while it's piping hot!!. Extra OTAFUKU OKONOMI SAUCE or mayonnaise (optional) will bring you a richer and more flavorful taste. Okonomiyaki is nutritionally well-balanced food! As Okonomiyaki is made up of a variety of ingredients, it is a nutritionally well-balanced food. The nutritional ingredients provide many of the basic elements necessary for achieving and maintaining a healthy body. There are more than ten different food items in each serving of Okonomiyaki. Specifically, Okonomiyaki has meat and egg that contain protein, fat and vitamin B, grain that contains carbohydrates and vitamin B, and vegetables that are rich in vitamin C and A. Furthermore, by using quite a bit of vegetable such as cabbage and bean sprouts in cooking Okonomiyaki, it can help to produce good skin and a glow of beauty. That's why Okonomiyaki is said to be a well-balanced food. You can change the meat, seafood and vegetable ingredients to suit your taste. This flexibility allows you to easily find a favorite variety of Okonomiyaki. With this great nutrition and delicious taste enhanced by Otafuku Okonomi Sauce you may treat yourself to this mouth-watering delight as often as you like! ●Rice top Okonomiyaki: If you are a lover of crispy, crunchy food, Rice Top Okonomiyaki is the answer to your prayers. ●Seafood Okonomiyaki: Salty, seasoned seafood, a good match for Okonomiyaki Sauce's tender sweetness. ●Pizza style Okonomiyaki: Okonomiyaki topped cheese and bacon is as good as real Italian pizza. Let East meet West. ●Mochi(Rice Cake) Okonomiyaki: For an energetic starter to the day. Okonomiyaki toped with Mochi (Rice Cake) will do it! ●Yakisoba Okonomiyaki: Noodles topped Okonomiyaki is the most popular style of Okonomiyaki enjoyed in Japan. Copyright © 2007 Y&Y co.,LTD All Rights Reserved.